Rockstar keeps trying to make battle royale modes work in their online games. Grand Theft Auto Online has had a few modes that feel inspired by popular battle royale games like Fortnite or PUBG. Now Rockstar is adding more battle royale modes to their newest multiplayer game, Red Dead Online. But overall these attempts at recreating the battle royale experience haven’t really worked. And I’m not sure if they ever will. Rockstar’s games just don’t feel made to support battle royale. Rockstar first started adding battle royale inspired modes into GTA Online. 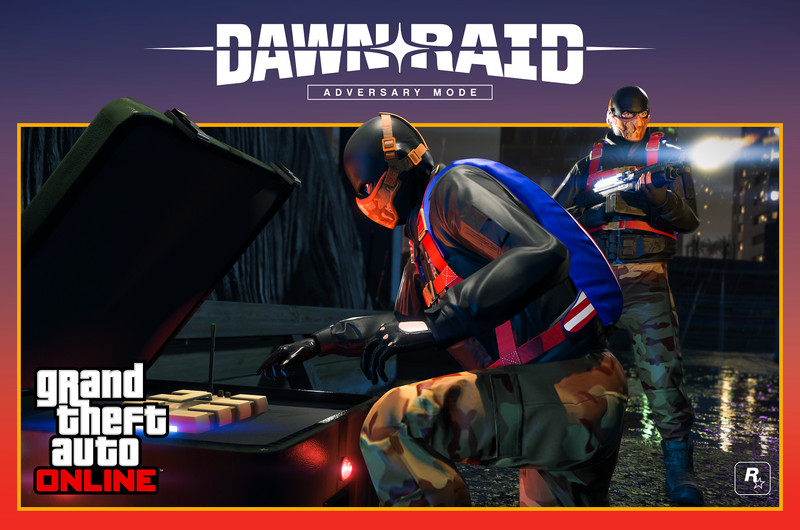 Their first attempt at capturing some of that PUBG feel was a mode called Dawn Raid. This mode had players hopping out of a plane and landing into a small area. Once on the ground, players have to search for weapons and supplies. Unlike PUBG or Fornite, players in Dawn Raid respawn and parachute back into the match. While I enjoyed Dawn Raid, it never felt as intense as a proper battle royale mode. Death wasn’t the end, just a temporary annoyance and 12 players split into two teams isn’t as exciting as 100 players fighting to be the last one standing. After Dawn Raid, Rockstar released a more ambitious mode that felt closer to a battle royale game. This mode, Motor Wars, included: Shrinking safe zones, parachuting into the map at the start, more players and no respawning. Motor Wars was also focused almost entirely on vehicle combat, which was a smart choice. GTA Online’s on-foot PVP combat isn’t great, so having players use weaponized vehicles was a way to avoid the lacklustre player combat. Motor Wars is the best Rockstar created battle royale mode because it took advantage of GTA Online’s vehicles and driving gameplay and built the mode around that strength. 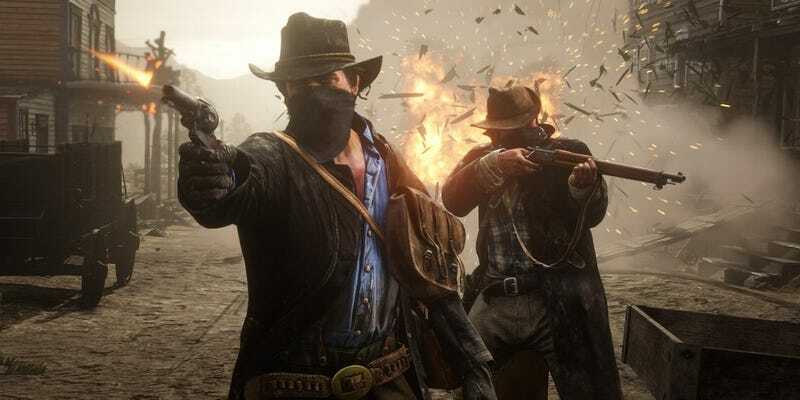 RDO’s first battle royale mode was included at launch. Make It Count focuses on throwing knives and arrows. This keeps the action close and deadly. Like PUBG, Make It Count features a shrinking play area and no respawns. Make It Count also tries to keep players from camping with a mechanic that reveals where a camping player is located if they stay in one spot for too long. Make It Count ends up feeling as intense as other battle royale games, while also feeling different from PUBG and other games. The lack of guns and a focus on keeping players moving means matches are short and you frequently encounter other players. Unfortunately, the player limit is capped at 32. This could be a tech limitation of Red Dead Online on consoles. Maybe a PC port could raise this number? Rockstar’s latest attempt at a battle royale mode, Gun Rush, is a step backwards from Make It Count. The first new mode added to Red Dead Online, Gun Rush is very similar to Make It Count. But as the name implies, the mode is filled with guns and this is a major problem. Red Dead Online’s combat is all about auto-lock aiming. Against AI enemies this works great, but in a PVP battle royale mode it feels annoying. The moment another player spots me I’m expecting to get shot. Gun Rush becomes a mode all about hiding. There is still skill involved, but auto-targeting feels like a bad fit for battle royale. Maybe if Red Dead Online adds free aim lobbies or softens auto-aiming, Gun Rush could be more enjoyable. But even without auto-aiming, moving around in Red Dead Online is slow and heavy. It is very easy to get stuck against walls or on doors while playing. PVP combat in Red Dead Online just isn’t well suited for this type of mode. Now, if Rockstar added a battle royale mode in Red Dead Online that had players only riding horses and wagons, that might be a better way to bring the excitement of battle royale into RDO. And it would feel more unique and take advantage of Red Dead’s Wild West setting. Until then, I’ll probably avoid battle royale modes in Red Dead Online.